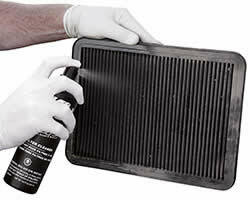 How Much K&N Air Filter Cleaner Do You Need to Use to Clean a K&N Air Filter? K&N's customer service department is frequently asked how to use the K&N Cotton Air Filter Cleaner & Industrial Strength Degreaser, known as Power Kleen. 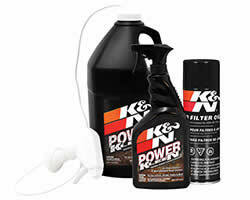 Power Kleen K&N Cleaner works to dissolve dirt build up as well as old filter oil, and can be washed away with water. K&N Power Kleen air filter cleaner is so good at cleaning dirt and grime that it is also used as an industrial strength degreaser. K&N Air Filter Cleaner is the only cleaner formulated to clean K&N Filtercharger® air filters made with cotton air filter material. Because the use of any other cleaning solution can void the filter's warranty, and quite possibly could damage the cotton media, some people are worried about how to use K&N cleaner and how much cleaner do they need. Before using K&N cleaner, it should be determined if it's time to clean the air filter. K&N stock replacement air filters can go up to 50,000 miles, depending on driving conditions, before cleaning is necessary. The large cone shaped air filters found on K&N air intake systems have so much surface area that they are able to go up to 100,000 miles under normal highway driving. 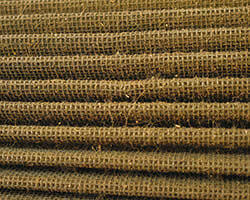 If your K&N air filter is used in dusty or off-road environments, they will require cleaning more often. 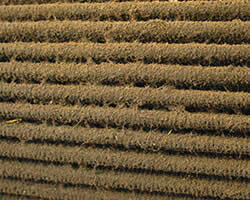 One common mistake made in K&N air filter maintenance is cleaning it too frequently. A K&N air filter is made with premium materials and designed to be cleaned time and again. So frequently cleaning a K&N air filter isn't necessarily an issue. However, cleaning it too frequently is a misuse of time that could be spent doing something else. 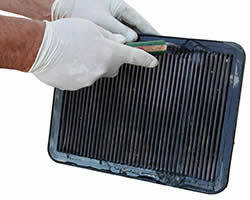 K&N recommends that you visually inspect your air filter once every 25,000 miles to determine if it needs to be cleaned. Cleaning your K&N Air Filter is not required if you can still see the wire screen on the entire air filter, regardless of how dirty it may appear. If you have not experienced a decrease in mileage or engine performance, chances are your K&N air filter is fine and does not yet need to be cleaned. When the screen is no longer visible some place on the air filter, it is time to clean it. You can see in the above pictures of when to clean a K&N air filter. To clean a K&N cotton gauze air filter, start by liberally spraying K&N Air Filter Cleaner onto both sides of the filter. Allow the air filter to soak for 10 minutes to loosen the dirt, but do not allow K&N cleaner to dry on the air filter. Rinse your air filter with cool low-pressure water applied to the clean side out in order to flush the dirt out of the filter. Continue to rinse the filter until all traces of cleaner are gone. Do not use K&N cleaner on polished or anodized aluminum. While there is a proper way how to use K&N cleaner, there isn't a cut and dry answer as to how much should be used. Sometimes an extremely dirty air filter will require a second cleaning, and of course a larger air filter will need more Power Kleen K&N cleaner than a small K&N air filter. The same thing applies when using K&N cleaner as an industrial strength degreaser. Large dirty jobs will require more cleaner and possibly multiple cleanings. K&N Power Kleen Cotton Air Filter Cleaner & Industrial Strength Degreaser is available on knfilters.com or through an authorized dealer in 12 fl oz, 32 fl oz, 1 gallon, and 5 gallon containers. 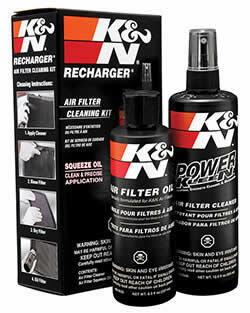 A 12 fl oz bottle of K&N Power Kleen air filter cleaner is included in every K&N Recharger® air filter service kit. K&N air filter cleaning and oiling instructions are included with each Recharger kit, or they can be viewed on the K&N Air Filter Cleaning page at knfilters.com.